"Fresh Japanese" is out now!
" Five a day? THIRTY a day is the norm to the Japanese..."
The Japanese diet is known to be one of the healthiest is the world. Its use of little or no oil, very fresh ingredients, and simple cooking methods etc. are already well known. 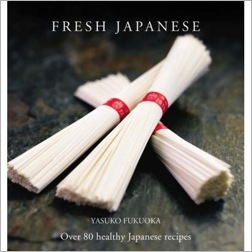 Yasuko Fukuoka reveals the real secret of the Japanese diet with 84 easy-to-follow recipes that are a fabulous feast for all senses and make you feel truly refreshed. Lots of the ingredients featured in this book such as sprouted rice, or recipes such as black sesame ice cream, will soon be the next "talk of the town" foods in the West. You should be among the first to know. Also available in German, Finnish, Dutch and French now. To purchase signed copies, please contact Yasuko at the link below.